The Blounge is one of the metro's, if not the only, tech-savvy salon. 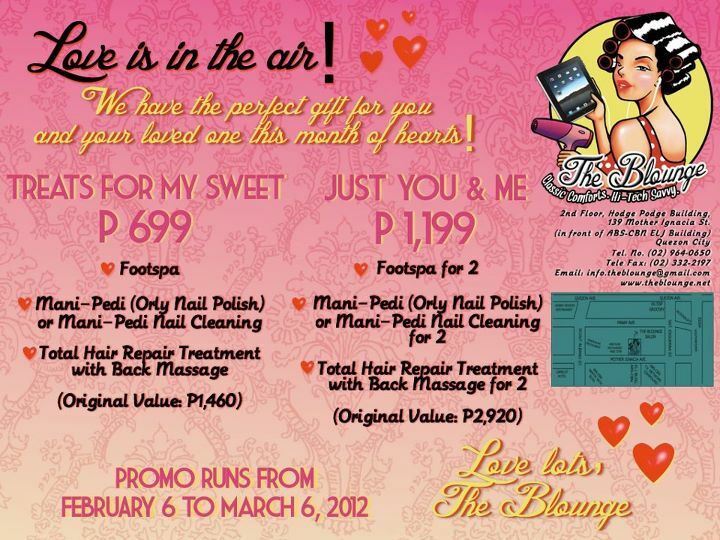 Thanks to their high-speed internet and Ipads, getting pampered while surfing the net for free is no longer a problem! During my second visit to the salon, I had my hair cut! I loved the result and what made me gush all the more was that one of our local celebs was also there getting her hair styled from curly to straight! Photo-op with model and celebrity talk show host, Phoem Barranda.... eeee, haha. She was just so sweet to pose with me in the middle of her hair styling, foot spa and eye makeup (which she was doing herself by the way and was using UD's Naked palette). I didn't have time to wait up because I had another appointment and I was so surprised she cheerfully excused herself to accommodate my request for a photo-op. Baet. I can't stop telling my friends and family how down-to-earth she was. I'm one happy gal that afternoon because I braved my way into telling a celeb that I wanted a photo with her (I normally don't have the guts to take a photo of or with celebs I come across with because I panic) and I strutted the streets with this nice new, less-than-five-hundred-pesos hair! Just as with Fab Salon, The Blounge stylists are trained by Lourd Ramos. It was the reason why I was perfectly confident they'd do a great job with my hair even if I can't effectively communicate the look I want for myself. And you can also check The Blounge's services and rates HERE. Don't forget to join the Neutrogena Fine Fairness BB Cream contest I'm hosting! The tech-savvy Blounge has treated me real sweet! I may've found my go-to salon this time :) Cute anime-ish layered hair+celebs.... oooh-lala! Is that already the new haircut? I love it. It's a little tapered at the bottom without too many layers. Just the way I like it. P.S. What face base are you wearing? Review it soon... As you also can tell it gives a nasty white cast. But to be fair, your skin looks clear. Yes Rae, it's the post-Blounge cut look :) It looks better in person tho. RE: face base, yup, it gives an unflattering whitecast, so sad. However, it could be the bad angle we were photographed or the undiffused flash of my cam kasi kahit si phoem, hindi naman ganyan ka-powdery/white yung face in person that time. Mumu mode kami pareho. your cut looks great on you sis! and she is really nice, often see her in Ortigas in the bldg of my first work. she's really pretty!